The name porcupine comes from the rice in the meatballs. By the way, if pineapple seems an odd ingredient, I thought so too. But don’t be afraid, it’s very subtle and adds a small amount of sweet zest to the dish. Mix egg, water and rice into ground meat. 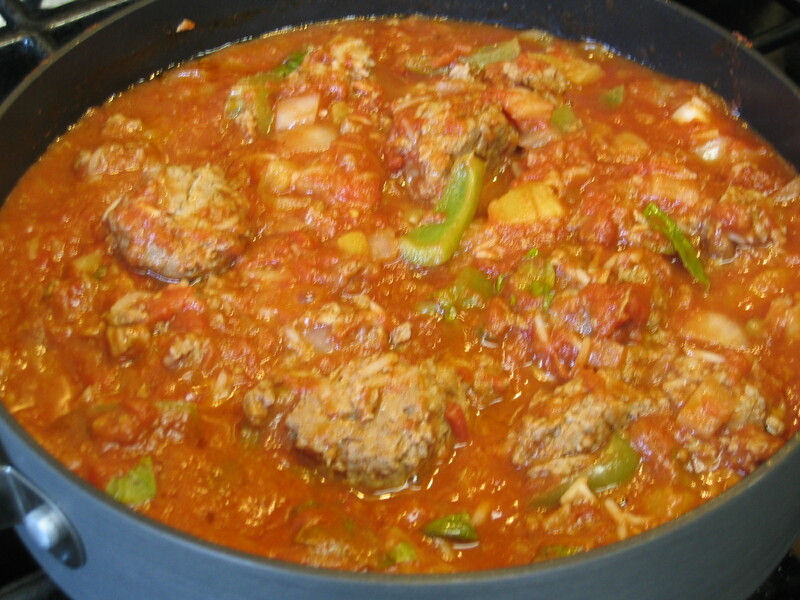 Take a small amount of meat mixture between your fingers and roll into 1″ or 1 1/2″ meat balls. TIP: If your fingers get too sticky, dip your hands in lukewarm water while rolling meatballs. In a large sauté pan, lightly brown meatballs on all sides in 1 tablespoon of oil over medium heat. Add onions and green pepper and sauté for one minute being careful not to break up the meatballs. Add crushed tomatoes, pineapple and Worcestershire sauce. DO NOT stir. Turn down heat and cover. When the meatballs begin to simmer, you can stir the pot. TIP: Rather than stir, use a spatula and simply turn the mixture over. This keeps the meatballs from breaking up. Simmer under a closed lid 45 minutes, stirring occasionally. Optional: In the final 10 minutes of cooking add fresh basil and sliced mushrooms. This entry was posted in Recipes and tagged Meatballs, Recipes. Bookmark the permalink.